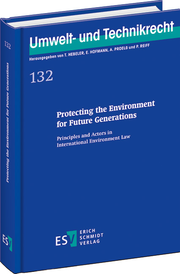 This book compiles the written versions of presentations held at the occasion of an international symposium entitled “Protecting the Environment for Future Generations – Principles and Actors in International Environmental Law”. The symposium was organized by the Institute of Environmental and Technology Law of Trier University (IUTR) on the basis of a cooperation scheme with the Environmental Law Institute of the Johannes Kepler University Linz, Austria, and took place in Trier on 29-30 October 2015. It brought together a distinguished group of experts from Europe and abroad to address current issues of international and European environmental law. The main objective of the symposium was to take stock of the actors and principles of international and European environmental law, and to analyze how and to what extent these principles have been implemented on the supranational and domestic legal levels.